Call of Duty: Black Ops III mixes the series’ familiar first-person shooting with a wild cyberpunk storyline. The narrative breaks apart the further the player progress unless it finally explodes in a level that mixes World War II, zombies, and dying dreams. That level, Demon Within, is both the high point of the campaign and a horrifying cry for help from the game itself. In Black Ops III, you play as a customizable special operations soldier who receives powerful cybernetic enhancements after being mauled in a disastrous mission in Ethiopia. Returning to combat with new powers, you and your partner discover a plot involving a respected operative named Taylor and his squad. After stumbling upon the site of a CIA operation that claimed hundreds of thousands of lives, Taylor and his squad apparently betray your organization. Throughout the game, the player chases after Taylor and faces off with his cohorts. Among these is Sarah Hall, who the player fights during an extended battle in Cairo. The first part of Demon Within is spent on a boss fight with Hall, who is piloting a giant robot. Black Ops III occasionally breaks form with the linear corridor shooting that has defined the series in favor of set-piece boss battles. The start of the level is jarring as a result. There is no lead up to the action, none of the ramping tension signature to the series’ level design. There is just noise and explosions. Hall arrives with little fanfare and the player defeats her in a lackluster fight. As Hall lays dying in the mech’s cockpit, the player rushes to read her mind using a device called a DNI or Direct Neural Interface. The DNI is key to the game’s plot, allowing characters to speak through a sort of telepathy, control their cybernetic abilities or leap direct into a subject’s memories. Forcing a connection with someone’s DNI fries their brain; the player connects with Sarah knowing it will kill her but instead of a quick memory rip, they find themselves pulled into a strange dreamworld. Until this moment, Black Op III has been content to let the player believe it is a mostly traditional tale of intrigue, albeit one where someone can speak directly into your mind or summon incendiary fireflies to light your enemies on fire. Demon Within begins to push back at those assumptions. Often, it resembles a narrative adventure game more than a Call of Duty level, with stretches of silent walking or extended exposition by Hall. This new realm is dotted with white trees, sparking with electricity. Each tree resembles an active brainstem. As players wander by the trees, they find bodies embedded in the dirt below. Soldiers from earlier campaign levels seemingly planted as fertilizer. They move through the forest until they find a baby in a medical bed, picking them up and watching as they fade into speck of light. The player later learns that an artificial intelligence named Corvus has taken root in the mind of Taylor and his squad, including Hall. These moments hint at that presence but only in a general sense. Fallen soldiers fertilizing cortical trees and a child born in the aftermath of experimentation. The player doesn’t learn about Corvus until much later, leaving these images as nonsense. It is a trick Black Ops III is fond of and one Demon Within will use constantly; present images without context and let players create the meaning. Demon Within proceeds to trample this technique into the ground with its next few sequences. The player reunites with Hall on a frozen battlefield. It is a representation of the Siege of Bastogne, a bloody World War II engagement that was part of the larger Battle of the Bulge. It is an important battle for Hall, a historical curiosity that she became obsessed with. A crucible she told herself that she never could have survived if she was there. On the one hand, we are watching as Hall’s dying mind tests itself, plunging into a battle that she believes impossible to survive. On the other hand, we have Black Ops III reaching back into the series’ earliest days, pulling back on respected source material and asking the player if they think they’re tough enough to endure revisiting it. And yet, there is some something hollow about this battlefield. A disembodied voice, the platonic ideal of a World War II soldier, welcomes the player to the battle and tells them to get up to the front. Cliche and tiresome music plays, a horrible satire of war movie battle scores. For Hall, this battlefield represents something larger than life. For the game, it is a theme park ride, a clownish gunfight with all the weight and significance of a laser tag battle. The player gets to blast Nazis using all of their cool future weapons and nanototech, ripping across the battlefield. As the player approaches fallen Nazi corpses, time seems to wind backwards until they rise back to life and attack the player. Black Ops III conjures these ghosts not to commune with them and reflect on them, but to let the player blow them away with their fancy hand cannon. It revives the past but offers the player no healthy means to engage with it. All they can do is destroy it, leaving behind corpses and wreckage and dust. Nowhere is this more clear than how it treats a key piece of war iconography: the tank. After an interlude where the player must fight off spectral wolves, the player find themselves dropped into a town square where they battle a German Tiger I tank. “Are you strong enough to defeat it,” Sarah asks. The tension between Hall’s admiration for World War II iconography and Demon Within’s reductive use of them makes itself known again. The dreaded Tiger tank becomes little more than a mini-boss to best, easily disposed by your modern day rocket launcher. 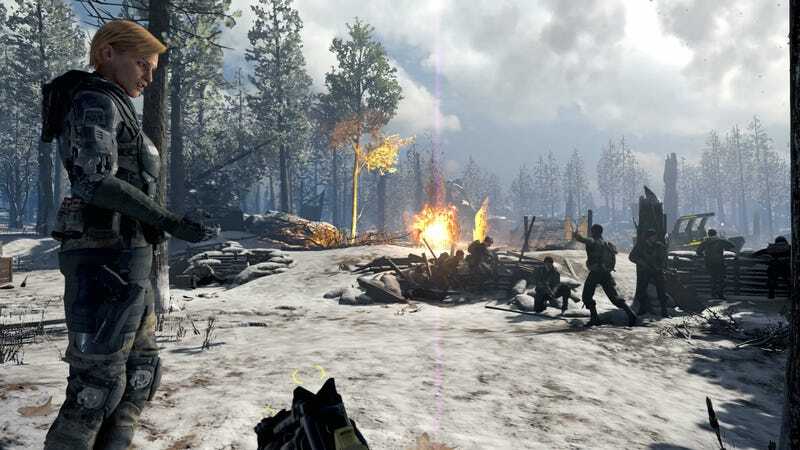 What might have been a formidable foe in an earlier Call of Duty title is little more than a stepping stone on the journey to player empowerment. Are we strong enough to defeat it? Of course we are, and Black Ops III is eager to let us prove it. Hall’s downward spiral mixes and blends series’ imagery into a jumbled pile of references. The Tiger I tank fight is contrasted with a battle against a futuristic war robot called an ASP. The fights have a similar pace and structure with only a slight difference: the ASP has a defense system that deflect rockets unless you shoot it with bullets first. Save for that small affectation, there’s little difference between fighting the Tiger I and fighting the ASP. There is a over a decades worth of time between the original Call of Duty and Black Ops III. How far we’ve come, to have the same boss fights over and over again. Look at all the progress we’ve made. We are strong in the ways that Hall could never be, pressing through a battle she could not comprehend and defeating armored foes in extended, occasionally grueling battles. The level saves its strangest trick for last. As Hall’s mind begins to fade, she traps the player in a burning house. Low groaning and shuffling noises hang on the air until the player is attacked by Nazi zombies. First appearing in Call of Duty: World at War, the Nazi zombie mode is a multiplayer horde mode where players must fight off waves of enemies. It grew to become a cornerstone of the series, as popular as any single player campaign or online mode. Black Ops III contorts itself in this moment, grabbing randomly from the series’ history to conjure a herd of tireless enemies. There is no rest, there is no escape. The player can only fight off wave after wave of monsters until Hall admits she is ready to die. It is tempting to look at this moment as a reflection on the series itself. Each new Call of Duty game has added new features and modes whose popularity eclipse the story campaigns. The self-serious stories of yesteryear were replaced with mindless shoot ‘em up game types full of pulp nonsense. Even as the player leaves World War II in the dirt and is hounded by the undead, they’re able to fight back. Even if Black Ops III feels hounded by the weight of its past, it would rather pretend it’s possible to shoot the past down than meaningfully reconcile with it. When the time comes to end the level, there isn’t a prompt to hold Hall’s hand or engage in any human, intimate act. Instead, you have to shoot her. If you want, there’s a bonus achievement for using a grenade to kill her called “Out With A Bang.” We can’t do anything but destroy everything we encounter; we are further rewarded for blowing everything up. Demon Within’s use of series iconography is fragmented, the intentions muddied by gameplay systems that invite no meaningful or introspective means of interaction. It rips and tears whatever vestiges it can from the series’ past to toss them into the player’s face. But instead of an indictment that acknowledges the series abandoned its roots, Black Ops III conjures a fun house of explosions that turns those things into a mockery. Just as Sarah Hall looks back on the Battle of Bastogne, convinced she could never be as brave as those who fought there, Black Ops III reflects on the rest of the series with a similar fear. It worries that I can’t be as good as what came before and ultimately, that fear is proven right. In the end, it decides to destroy the things it fears. As Hall dies, a massive nuclear explosion rips through the level. It is meant to wipe away the ghosts of the past, but that attempt is sabotaged by the fact that we’ve seen this image in Call of Duty before. It recalls the nuclear explosion from Modern Warfare’s infamous level ‘Shock and Awe.’ But where that game found time to reflect on the damage, forcing the player to live out the bomb’s aftermath, Black Ops III can’t be bothered to reflect on the ruin, cutting back to the real world with a flash. Throughout the game, the player character is told that they need to let go. It’s heavily implied that the game is an extended hallucination they are having after dying during the operation meant to grant them cybernetic powers. After interfacing with Taylor’s DNI earlier in the game, they appear to linger on as a type of digital ghost within Taylor’s mind, unable to find peace. Instead of clinging to life, a fraction of what they once were, they need to accept that it is okay to fade away. Black Ops III struggles with this same problem. It fights and rages, unable to accept that it’s a shadow of what came before.